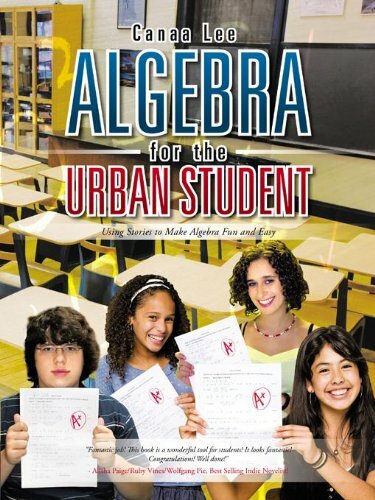 Before you read my review of Algebra for the Urban Student: Using Stories to Make Algebra Fun and Easy by Canaa Lee, you should know that I am one of those strange people who really enjoy a good Algebra problem. I have always loved Algebra, so I was pretty excited to get my hands on a book about Algebra for review purposes. I am also a homeschooling parent so I am always interested in textbooks, especially those that incorporate new methods of learning. This book did not disappoint. Lee is a high school math teacher who conceived of the idea for this book while she was working at Little Rock Central High School in Arkansas. She was a math teacher given the task of figuring out how to incorporate reading and literacy into her math class. To do this, she would find several topics in her class that shared a theme and try to build a story around them in order to teach them together. The book relies heavily on building an ongoing story throughout the entire course in order to help students retain knowledge and follow along as they shift from one concept to another. As someone right in the midst of teaching Algebra, I think this is a brilliant concept. Lee wanted to demonstrate to her students that Algebra could be demystified and could become more than just a jumble of numbers and letters. This is especially important in some urban environments where the population is largely poor and underrepresented when it comes to education. Test results from many urban areas prove this time and again. I also know from teaching my own children (who hate math) that making the concepts of Algebra clearer can be a daunting task. Incorporating these concepts into stories can get through to students who simply don’t learn from numbers alone. The book covers a plethora of relevant and important topics: equations, inequalities, absolute value, graphing, slope, ordered pairs, slope-intercept form, relations, functions, statistics, ratios, proportions, rate of change, compound inequalities, geometry, perimeter, area, surface area, volume, factoring, quadratic equations, quadratic trinomials, parabolas, domain, range, vertex, vertical stretch, horizontal stretch, horizontal shift, polynomials, monomials, binomials, trinomials, leading coefficients, and discriminants. It was very thorough. The author provides ample practice problems throughout the book. She also makes it very clear how the problems relate to every day life. I found it very relatable and relevant. I would rate the book a 4 on a 5-point scale. Providing a supplement with an answer key to check the answers after doing the problems would definitely move it up to a 5. This is a book I would use in teaching my own children when we run across a particularly troubling concept. Lee has made math relatable for people who might have trouble.